Take a good look at the diagram above. 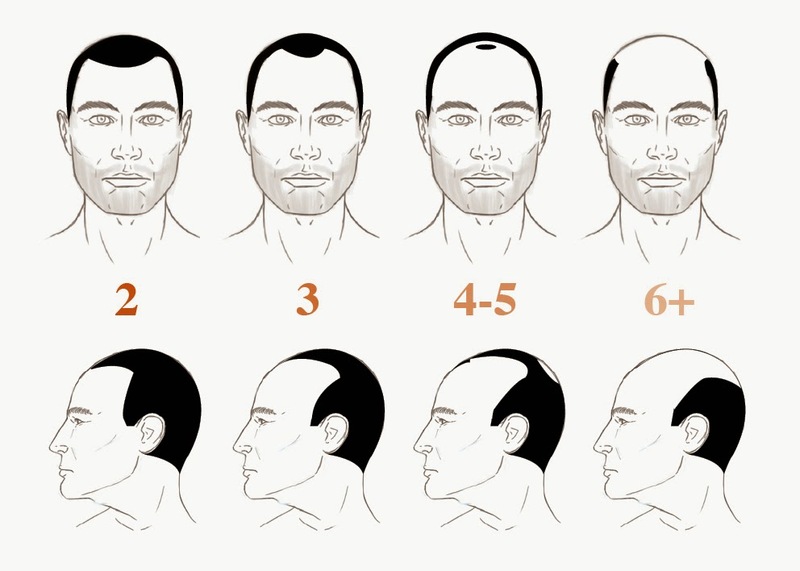 This diagram represents a rough outline of the Norwood Scale - a generic measurement of the stages of male pattern baldness. The Norwood Scale takes measurements of hair loss in men from stages 2-7. The Norwood Scale should be used to diagnose the stage of hair loss where you are currently at, in order to begin the process of relevant treatment. Over 60% of men suffer from some stage of hair loss by the time they reach their 40s. Hair loss most commonly occurs in men from the age of 30 - this usually consists of receding of the temples/hairline and thinning hair on the crown of the head. The speed of hair fall depends on a number of factors such as genetics and treatments. Hair loss sufferers in their 20s are more prone to become emotionally affected by this devastating process, with some young men suffering from serious physiological conditions such as depression. The hair loss treatment market has never been as big as it currently stands, with a wide array of hair supplements, foams, shampoos and surgical procedures readily available for men and women looking for a quick fix solution. Unfortunately it should be noted that, as it stands, there is not a 100% cure for hair loss. Prescription treatments such as Propecia offer excellent hair loss solutions for men and have a successful track record, but the major down side is that drugs Propecia can come with some nasty side-effects such as erectile dysfunction and outbreak of spots on the facial skin. CAN HAIR LOSS BE SLOWED DOWN OR PREVENTED? Many men (and women) have turned to affordable, natural hair loss solutions such as HR23 in an attempt to combat hair loss and thinning hair. Although there are many hair supplements that claim to stop hair loss, the truth is most of these products probably don't work. Much of this depends on each individual and how best your own genetics work and react with the specific additives in each supplement. In many cases, your mission to find the right hair loss treatment will more than likely need a good period of trial and error. HOW TO CHOOSE THE RIGHT TREATMENT? With the hair care market constantly expanding, choosing a hair loss treatment can be quite a daunting task. If you're looking to avoid side-effect prone drugs and expensive surgical procedures, then you'll probably want to opt for a safe, all-natural hair health supplement that comes with a good success rate. 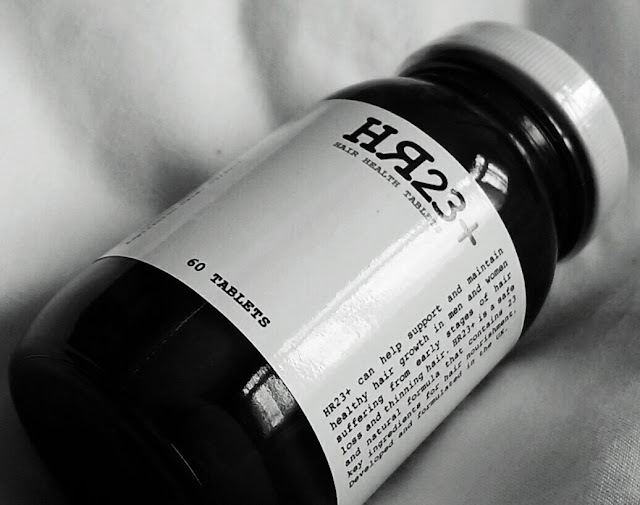 Popular hair restoration supplements like TRX2 and HR23 come with excellent reviews from men and women who have used them on a regular basis over a long period of time. Potent ingredients such as saw palmetto and biotin offer excellent nutrients for healthy hair growth, and these are safe ingredients that are quite common in many anti-hair loss supplements. If you are seriously considering taking hair health supplements then one important thing should be noted: For best results, hair supplements should only be taken if you suffer from early stages of hair loss - ideally from Norwood Scale 2-3. The earlier you tackle the problem the best chance you have of sustaining your hair for a longer period of time. Visit the Natural Hair Loss Treatment Store for more information and options for hair loss.